Below information can be found on various topics related to Iceland and the US. Special attention is drawn to the FAQ´s that provide a clear overview of information and assistance that the Embassy is able to provide. If you have further questions, please contact the Embassy. Icelanders in the United States can apply for a Icelandic Passport at the Embassy in Washington, and The Cosulate General in NY, applications are processed by appointment only between 9:30 am – 11:00 am (due to time difference between Iceland and US). DC: Tel: 202-265-6653 NY. Tel:646-282-9360. A photograph of the applicant is taken. Also fingerprints are taken of induviduals older than 12. As of 01/01/2018 the cost is USD 115. For children under 18 and seniors over 66 the cost is USD 50. We accept cash or checks only. After applying it takes 2-3 weeks for the applicant to receive the new passport. For children both parents need to be present. If both parents can not be present a certified consent form must be provided from the parent that is absent. Unless proof of sole custody is shown. Icelandic Consulates can no longer accept applications for Icelandic passports. Consulates can no longer prolong the validity of Icelandic Passports. Emergency Passports are only issued to Icelandic Citizens that are not able to apply for new passports in Iceland or at the Embassy in Washington. It should be noted that Emergency Passports are not ideal travel documents and not machine readable. US citizens can travel to Iceland on holiday or business for 90 days or less, in accordance with the Visa Waiver Program. US citizens wanting to stay longer or reside in Iceland must apply for a residence permit at the Icelandic Directorate of Immigration. Since Iceland became a member of the Schengen Visa Agreement there are 4 offices in the United States that issue visas on Iceland's behalf. For information on extended tourist visas, residence and employment permits, please visit the website of the Directorate of Immigration of Iceland. An Act amending the Icelandic Citizenship Act, No. 100/1952, enables Icelandic citizens to retain their Icelandic citizenship even if they apply for citizenship of a foreign state. The amendments entered into effect July 1, 2003. A. An Icelandic citizen will retain his citizenship when becoming a citizen of another state, provided that state allows double citizenship. This also applies to any children below the age of 18 years in that person's custody. The conditions set in Article 8 of the Icelandic Citizenship Act as regards residence or stay in Iceland prior to the age of 22 years must be fulfilled. B. In order to acquire citizenship of a state not allowing double citizenship, an Icelandic citizen must apply for release from Icelandic citizenship before the new citizenship can be confirmed. An application for release from Icelandic citizenship shall be lodged with the Ministry of Justice. The application must be accompanied by a confirmation that the new citizenship will become effective when release is obtained from the Icelandic citizenship. C. An Icelandic citizen who has accepted citizenship of another state and therefore has lost his Icelandic citizenship without the other state having made such a requirement, can apply for renewal of the Icelandic citizenship to the Ministry of Justice. The applicant must be a resident of Iceland or fulfill the requirements of Article 8 of the Act relating to stay in Iceland. Renewal can only be granted if confirmation is available to the effect that the applicant can accept Icelandic citizenship without loss of the present citizenship. Such applications must be lodged prior to 1 July 2007. D. The provision of Article 8 of the Citizenship Act, to the effect that an Icelandic citizen who was born abroad and has never been domiciled in Iceland or resided in Iceland for any purpose indicating a desire to be an Icelandic citizen, shall lose his citizenship on reaching the age of 22 years, remains unchanged. Loss of Icelandic citizenship will however not occur if the person in question is not a citizen of any other state, and would therefore become stateless. Thus, double citizenship is not allowed for these citizens. US citizens planning to move to Iceland on the basis of a residence permit from the Directorate for Immigration, can find various information on rules and regulations in that regard on the website of the Directorate of Customs. The website island.is provides comprehensive information on how to go about moving and other valuable information for those seeking to move to Iceland. The Embassy can also provide further information. Please contact the District Commissioner in the area where you intend to marry. For more information please see this information page at the District Commissioners website. Here you can find the Embassy´s answers to various questions related to consular and other issues. How do I apply for an Icelandic citizenship? Foreign citizens can apply for an Icelandic citizenship to the Icelandic Ministry of Justice. Icelandic citizenship is granted in accordance with Icelandic law. How can I locate my relatives in Iceland? If you know their full names, most Icelanders can be located either through the National Registryor the Icelandic phonebook. Can the Embassy assist in applying for a residence permit? No. Applications for a residence permit should be directed firsthand to the Icelandic Directorate for Immigration. What can I bring with me when traveling to Iceland (food, fishing gear, alcohol and pets)? The Directorate of Customs website answers these and other questions. Do I have a machine readable passport so that I can enter the US? Icelandic citizens carrying a passport issued after June 1st 1999 should have a machine readable passport. For further information about machine readable passports see the US Department of States website. 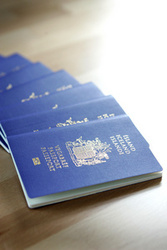 Biometric passports are passports that include a computer chip that can store a digital photograph, information regarding retinal verification and fingerprints. These passports are not yet issued by Iceland, but in future they will become standard travel documents for travel to the US and other nations. They should not be confused with electronically readable passports that are now required for travel to the US.